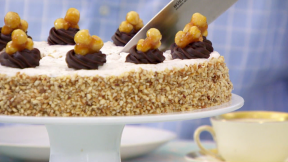 This hazelnut dacquoise recipe appears as the technical challenge in the Quarterfinals episode of Season 2 of The Great British Baking Show. For the dacquoise, preheat the oven to 180C/fan 160C/350F/Gas 4. Tip the blanched hazelnuts into the bowl of a food processor and pulse until coarsely ground. Spread the nuts out in a layer in a roasting tin and bake for 10-12 minutes or until golden-brown, stirring every three minutes. Remove from the oven, transfer to a large bowl and leave to cool. When cool, stir in 100g/3½oz of the caster sugar and the cornflour. Reduce the oven temperature to 150C/130C (fan)/Gas 2. Line three baking trays with parchment paper and, using a small dinner plate as a guide, draw a 21cm/8¼in diameter circle on each. Set aside. Carefully position oven racks in the upper, middle and lower third of the oven. Make the meringue by pouring the egg whites into the clean bowl of a free-standing mixer fitted with the whisk attachment. Add the salt and whisk on medium speed for about two minutes, or until white and frothy. Increase the speed and add the remaining 200g/7oz caster sugar, one tablespoon at a time, to make a stiff, glossy, peaked meringue. Gently fold the ground hazelnut mixture through the meringue. Spoon the meringue mixture to a large piping bag fitted with a 1.5cm/⅝in plain nozzle and pipe the meringue into a spiral starting at the centre of each circle and working outwards to fill your template. Bake for one hour, rotating the top and bottom baking trays halfway through cooking. Keep an eye on the meringues toward the end of cooking as they may catch and darken too much. Turn off the oven and leave to cool in the oven, with the door open, for at least 45 minutes. For the coffee custard filling, heat the milk in a heavy-based pan and bring to the boil over a low heat. Meanwhile in a medium bowl, whisk the egg yolks, caster sugar and coffee and chicory essence together. Whisk in the cornflour, one tablespoon at a time. Pour the hot milk over the egg mixture, whisking continuously, then pour back into the pan. Bring to the boil, whisking continuously, reduce the heat and simmer, whisking for 2-3 minutes, or until smooth and very thick. (You need to use a whisk during this process as the mixture will suddenly thicken and form lumps.) Remove from the heat and leave to cool for at least an hour. Whisk the whipping cream in a bowl until soft peaks form when the whisk is removed from the bowl. Fold half of the cooled coffee mixture into the cream, adding as much as necessary to form a spreadable consistency. For the hazelnut praline, line a baking tray with non-stick baking paper. Melt the caster sugar in a small frying pan until it turns golden-brown or reaches 300C/572F on a sugar thermometer. Add the hazelnuts and lemon juice, stir well and tip onto the lined baking tray. Using two teaspoons and working quickly before the caramel sets, form 12 praline clusters of three hazelnuts each for decoration. To assemble the dacquoise, place one of the meringue layers on a large, flat serving plate and spread with one-third of the coffee custard filling. Place another meringue layer on top and spread with another third of the coffee custard filling. Top with the final meringue layer and spread the remaining coffee custard filling on the sides of the dacquoise, leaving the top bare. Press the roasted chopped hazelnuts onto the sides of the dacquoise to cover. Pipe 12 swirls of chocolate ganache on the top of the dacquoise and decorate with the hazelnut. Equipment and preparation: you will need a piping bag fitted with a 1.5cm/⅝in plain nozzle and medium star nozzle, a food processor, three baking trays, a sugar thermometer and a free-standing food mixer with a whisk attachment.